Last spring I went on the most amazing little holiday with my mum to Casa De Laila, in Malaga where the days consisted of yoga, sun and homemade vegetarian food. On the last night the starter was a beetroot dip covered in feta and served with bake tortilla chips. It was so good we were literally licking the bowl clean. I've been craving it since that day, but only got around to making some this week. I used Maple Spice's baked almond feta recipe for the cheese, so if you're making that it's slightly more time consuming, but the actual dip is super easy! 1. Stick the beets, yoghurt, garlic, sale and olive oil in a blender and blitz until combined and still a little chunky. 2. 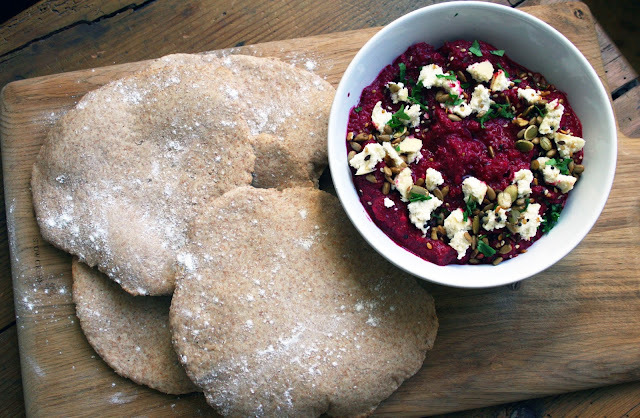 Pop the beet dip in to a bowl, crumble the almond feta over then sprinkle with the seeds and parsley. 3. Serve with warm pita bread (or whatever else you fancy) and enjoy! I'm Heather, I live in a little house with my boyfriend Mr Hef, and my dog Travis - I like eating, taking photos of and writing about vegetables (and other non-meaty foods).